I have been noticing extreme dryness on my hands lately and one of my friend even ended up noticing that, which is of course embarrassing! :’D Ironically, he picked this same product as soon as I displayed to him my intentions of getting this one billed. I think he has somewhat managed to utilize half the content which is pretty much a straight out over-speed. *LOL* So, let’s begin with the review! 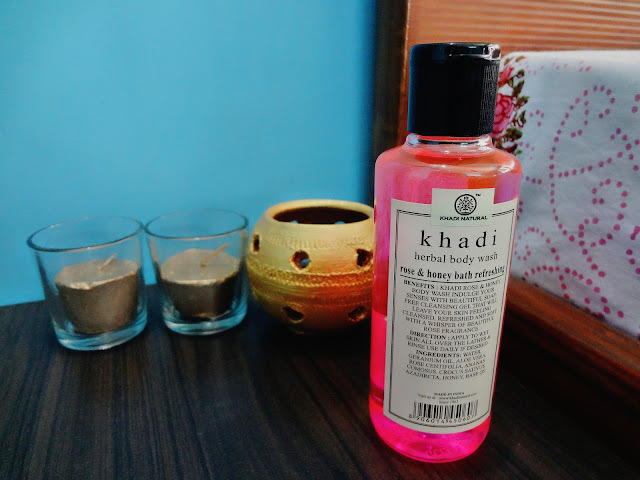 Benefits: Khadi Rose & Honey Body Wash indulge your senses with beautiful soap free cleansing gel that will leave your skin feeling cleansed, refreshed and soft with a whisper of beautiful rose fragrance. Directions: Apply to wet skin all over then lather & rinse. Use daily if desired. Ingredients: Water, Geranium Oil, Aloe Vera, Rose Centifolia, Ananas, Comosus, Crocus Sativus, Azadircta, Honey, Base, QS. Packaging: Yes, the elegant packaging did tempt me in buying this product. But then, I indeed was on a lookout for buying a body wash for my drought land mimicking skin. :’D I guess there’s nothing really fancy in context of packaging but then it’s just so simple and the pink product within is enough to make me reach out for it. It comes in a transparent cylindrical bottle with a black flip open, easy to use lid. I was suppressing myself from developing any expectations until I try it out because firstly it’s simply a body wash & I can’t expect miracles out of it. But then, I read the ingredient list and it kinda appeared impressive. This body wash smells pretty good, like roses. But the fragrance doesn’t really last long. I mean after bathing, I failed to detect its traces. Yet it still makes you feel pampered during the bathing session! 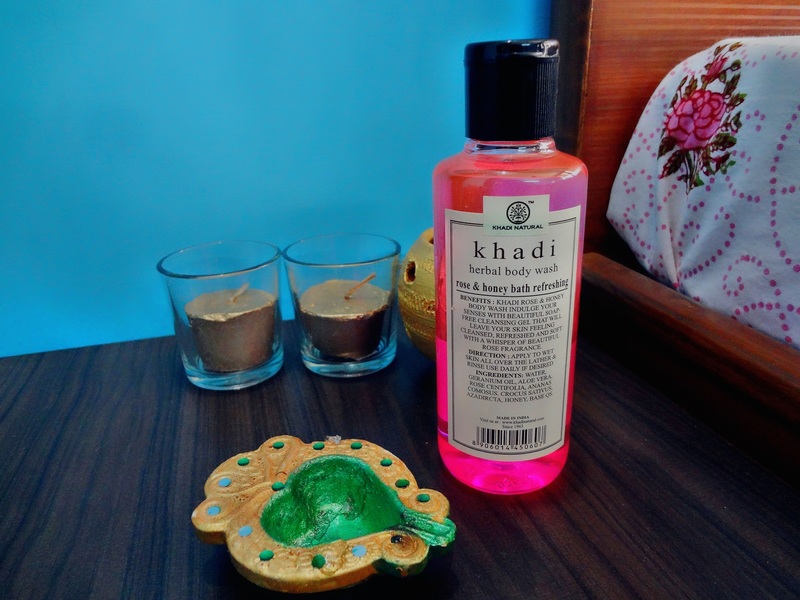 It gets rinsed off easily and leaves off the skin feeling soft. It does provide hydration and subsides the flakiness. Though it lathers, it generates only slight foam. It cannot completely help the dry skin from skipping upon a lotion but for normal skin, it would work well in the fall! Final Verdict: I love it and so does my school friend! *LOL* It feels good to know how the same product fares with other people, right?